TCF Bank Stadium is the brand new state-of-the-art football stadium for the Minnesota Golden Gophers college football team at the University of Minnesota. The 50,805 seat on-campus horseshoe style stadium opened on September 12, 2009 with the Gophers playing the Air Force Academy. 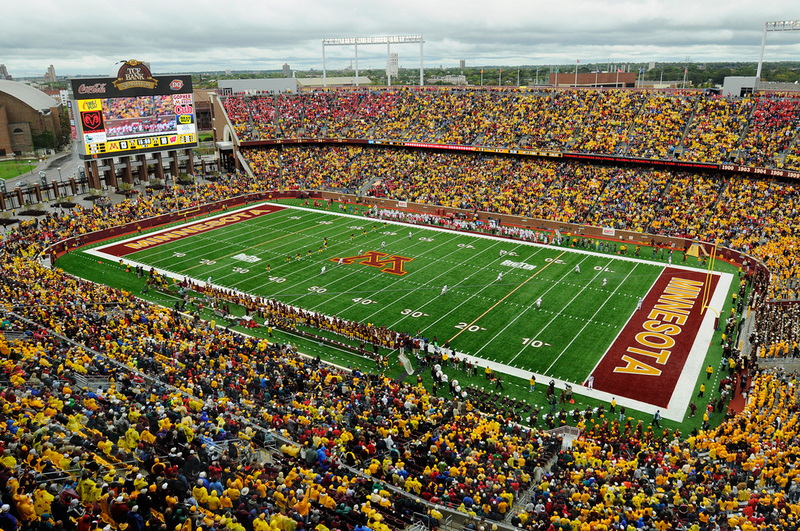 TCF Bank Stadium is designed to support future expansion to seat up to 80,000 people. TCF Bank Stadium site is located on the northeast side of the Minneapolis campus, near the site of the former Memorial Stadium. The groundbreaking of TCF Bank Stadium was September 30, 2007. TCF Bank Stadium took less than two years to build and cost nearly 300 million dollars. The Minnesota Vikings will play the 2015 NFL season in TCF Bank Stadium while the new Vikings Stadium is being constructed.